Following a successful start to Pac-12 play, USC’s men’s tennis team will take on conference foes Stanford and California at Marks Stadium this weekend, marking the Trojans’ third and fourth Pac-12 matches of the season. The Trojans (20-2, 2-0) have won 11 consecutive matches, and look to continue their streak against the No. 52 Cardinal (9-2, 2-0) and the No. 18 Bears (12-3, 2-0). After a brief stint atop the national rankings, the Trojans enter this weekend’s conference matchups at No. 2 in the Intercollegiate Tennis Association’s national team rankings. Senior captain Ray Sarmiento leads USC in individual rankings with the No. 3 spot in the nation, a career high for the Rancho Cucamonga, Calif. native. Following in Sarmiento’s footsteps are No. 12-ranked junior Yannick Hanfmann, No. 44-ranked junior Jonny Wang, No. 56-ranked junior Roberto Quiroz and No. 100-ranked sophomore Max de Vroome. Hanfmann is ranked 12th in the country, while Wang, Quiroz and de Vroome are ranked 44th, 56th and 100th, respectively. Sarmiento and Hanfmann have climbed up to the No. 5 spot in the doubles rankings together, while senior Michael Grant and freshman Nick Crystal are ranked No. 60. Crystal has been partnering up with Quiroz lately, and the duo has yet to lose a match. The two were instrumental in USC’s success last weekend, a road trip during which they took home 6-1 wins against Oregon and Washington. 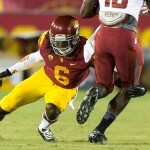 The Trojans insist that they will keep their competitive juices flowing against the Cardinal and the Bears. “We try to prepare mentally for each match the same way and make sure we are 100 percent ready to go every match,” Sarmiento said. Stanford, California and USC are all 2-0 in Pac-12 play, with the Cardinal and Golden Bears both racking up wins over Utah and Arizona last week. Stanford boasts the No. 55-ranked singles player in the nation in Maciek Romanowicz, but has no ranked doubles teams. Cal, on the other hand, has two ranked singles players in No. 70 Ben McLachlan and No. 89 Campbell Johnson. The Bears also can claim two ranked doubles teams: Gregory Bayane and Chase Melton are ranked No. 14 and McLachlan and Andre Goransson are ranked No. 67. “Right now, Cal is better because of the [rankings] but Stanford has [its] history and we can’t underestimate [that],” junior Roberto Quiroz said. Indeed, the Cardinal have won 17 national championships in men’s tennis, just behind the Trojans, who have earned 20 national titles — the most of any team in the country. 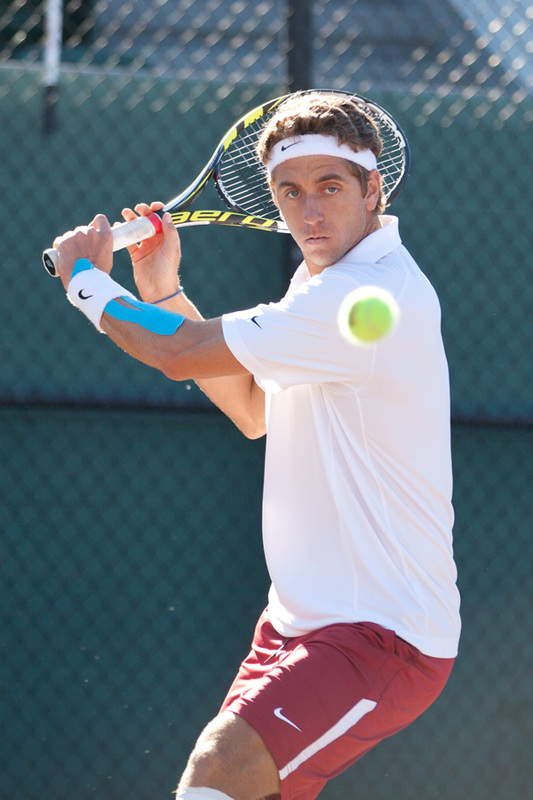 Stanford is also the only men’s tennis team other than USC to have won the national championship four years in a row. Though Stanford has fallen out of the national spotlight recently, the Trojans still treat each matchup with respect and look at each as a learning opportunity. Moving forward will be important for Sarmiento, who lost both of his singles matches last weekend — his first back-to-back losses of the season. The losses brought Sarmiento’s total record to 18-7 overall on the season, and 10-2 in dual match play. Quiroz, along with de Vroome and junior Eric Johnson, has reached the 20-win club in singles play this season, with Johnson and de Vroome each earning 21 wins. Quiroz has also strung together an impressive 10-match winning streak in singles. This year, the team is trying to rise above and beyond in the Pac-12 conference. The Trojans face the Cardinal today at 1:30 p.m. and the Bears on Saturday at 1:00 p.m. in Marks Stadium.